Many years ago, a then-workmate of mine (are you reading this, Paul? We should have lunch!) put forward the conjecture that virtually any video game could at its essence be distilled down into a single meta-game; a game which he used to call “The Space Bar Game”. And no, it had nothing to do with the Steve Meretzky graphic adventure game pictured here. Our version of The Space Bar Game is only a theoretical game and has never actually been produced (at least, not to my knowledge). But the core thing is this: the gameplay of The Space Bar Game is analogous to the gameplay of most (and maybe all) other video games out there. When you start up The Space Bar Game, the screen goes entirely black except for a giant numeral “0”, centered on the screen. It doesn’t matter what color the number is drawn, but we usually assumed that it would be white, or some other neutral tone. At this point, the game screen remains static and the game waits for player input. The only inputs which the game recognises are the keyboard’s space bar, and whatever mechanism the operating system uses to quit the program (so alt-F4 on Win32, Command-Q on OS X, etc). Of course, quitting the program in The Space Bar Game leads to the program exiting; in our “this game is like a condensed version of every other game” analogy, this quitting behaviour is directly analogous to the same quitting behaviour of those other video games. It’s not particularly interesting, but it is a legitimate thing which the player could do at almost any time. As you might expect from the game’s title, the more interesting part of The Space Bar Game is the behaviour of the space bar. For when the player presses the space bar, that giant numeral “0” is replaced by a giant numeral “1”, and a happy “bling” sound is produced from the computer’s speakers. At this point, the game screen again remains static, and the player is confronted by his second important gameplay decision: will he quit the game now, or will he — dare he — press the space bar again? Assuming that our player is an intrepid soul who chooses to continue, a hesitant, tremulous second press of the space bar produces a second happy “bling” sound, and a numeral “2” appears on the screen in place of the “1”. If he should continue pressing the space bar (bling! bling! bling! ), the number displayed on screen continues to rise, until it eventually reaches ‘9’. At this moment, our player is likely to pause expectantly, savoring the heady sense of anticipation over the threshhold he’s about to pass. A deep breath. Slowly, expectantly, he presses the space bar one more time. The screen now reads “10”, and our player is presented with the same choice again; quit, or press the space bar. 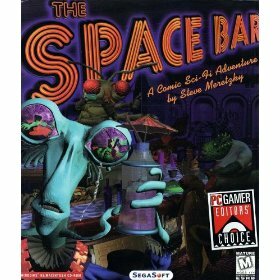 As I design, play, and think about video games, I find myself repeatedly being reminded of The Space Bar Game. Once you know about it, you see it everywhere. Crafting in World of Warcraft is just a paper-thin veneer over The Space Bar Game. Experience points and equipment in virtually every RPG out there are The Space Bar Game, too. It’s everywhere in RTSes and in games like Civilization and The Sims, and you could make a case for it even in FPSes; particularly the more modern ones which contain forms of skill advancement. Do the thing you have to do to make the number bigger. Bigger numbers are better, because bigger numbers are closer to even bigger numbers, and you want to reach the even bigger numbers, don’t you? And if you think that The Space Bar Game sounds like a perfectly tedious, boring little game (as I do), then.. why do people suddenly find it to be interesting when it’s had a coat of paint and been renamed to “levelling your fishing skill”? I don’t have an answer. But it bears thinking about. Perhaps someday I’ll actually implement The Space Bar Game and put it up on the site; it shouldn’t take any more than an hour or two to put together. Maybe it wouldn’t be as bad as it sounds. Maybe it’d even become hugely popular, and people would spend weeks and months of their lives trying to reach the top of the leaderboards. 25 May, 2009 in Game Design.